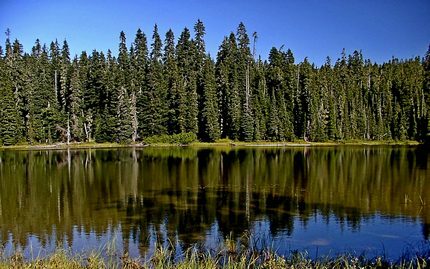 Here is another great little hike that takes you to two beautiful mountain lakes. The trail begins off Forest Road #420 and takes you through dense forest. The trail actually looses elevation on its way to the first lake. It is only about a mile to the first lake. 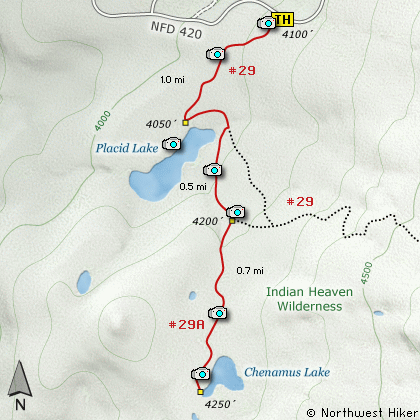 This will also be the junction to the trail that you will need to take to the next lake. But take time to enjoy Placid Lake. Then return to the junction and continue on to Chenamus Lake. If however, you plan to approach this hike from the Columbia River Gorge area, then begin at I-205 in Vancouver, Washington and head east along SR14 for about 41 miles to the exit to Carson, WA via the Wind River Highway. Follow the Wind River Hwy north through Carson. In 7.5 miles you will pass through the little community of Stabler, and in another 5.8 miles you will come to the junction of Forest Road 30. Turn right onto FR30 and follow this road for 13.2 miles north along the Wind River and then up a steep incline and onto a plateau where	you will come to the junction of the Curly Creek Road. Continue north on FR30 for another 5.1 miles and you will come to the junction of Forest Road 420. Bear right onto FR420 and follow it east for a little over a mile and you will come to the trailhead for this hike. Parking is on the left, but the trail is across the road on the right.